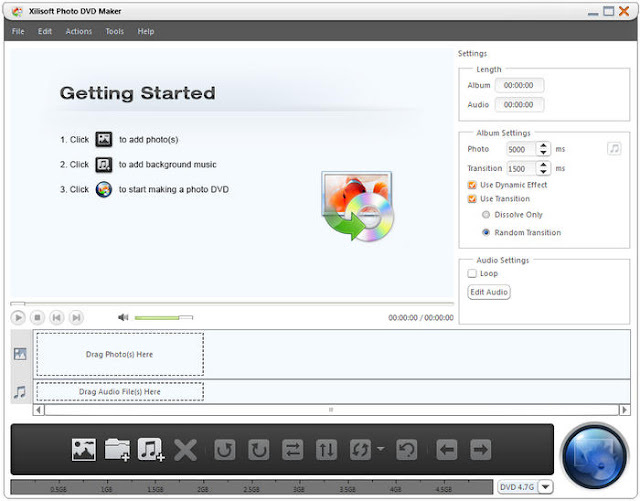 * Convert Photos to DVDsLiven up your photo library by turning it into a DVD movie and view them on your DVD players. * Create ISO Files and DVD FoldersCreate ISO files and DVD folders for your photo collection. * High-Speed Photo to DVD ConversionTakes full advantage of the speed of your multi-core CPU system during photo to DVD conversion with multithreading and multi-core CPU processing fully supported. * Add Transitional EffectsApply fade-in and fade-out effects or many other feduring photo transitions; adjust the transition duration. * Add Audio FilesIntroduce background music to your photo slideshow; add multiple audio files to a single DVD movie; set audio to loop during playback; apply audio fade-in and fade-out effects. * Adjust Output ParametersAdjust various output, video and audio parameters including: writing speed, volume label, video quality, audio channel and quality. * NTSC and PAL standards are both supported, thus there's no impossibility of playing created DVD on any DVD player no matter in European, North American, Asia, or any other places. * Auto-Add ChaptersAdd chapters to your DVD title automatically according to a predefined interval. * Set your copy of Xilisoft Photo DVD Maker to auto-exit, shut down, hibernate, stand by your PC, or do nothing at the end of the photo to DVD conversion process. * Xilisoft Photo DVD Maker's interface is available in 7 languages: English, French, Spanish, German, Japanese, Simplified and Traditional Chinese.